Photo courtesy of Clarke American Checks, Inc.
Headquartered in San Antonio, Texas, Clarke American supplies personalized checks, checking-account and bill-paying accessories, financial forms and a growing portfolio of services to more than 4,000 financial institutions in the United States. Founded in 1874, the company employs about 3,300 people at 25 sites in 15 states. In addition to filling more than 50 million personalized check and deposit orders every year, Clarke American provides 24-hour service and handles more than 11 million calls annually. Clarke American competes in an industry that has undergone massive consolidation. Three major competitors have 95 percent market share and vie for the $1.8 billion U.S. market for check-printing services supplied to financial institutions. Since 1996, Clarke American's market share has increased by 50 percent. Revenues were over $460 million in 2001. The company is organized into a customer-focused matrix of three divisions and 11 processes. It is in a nearly continual state of organizational redesign, reflecting ever more refined segmentation of its partners and efforts to better align with these customers' requirements and future needs. Since 1996, Clarke American's market share has increased by 50 percent to its current 26 percent. In 2001, more than 20,000 ideas from Clarke American associates were implemented for a cost savings of an estimated $10 million. Since 1997, surveys of partner organizations consistently have shown a 96 percent satisfaction rate. In 2000, Clarke American associates averaged 76 hours of training, more than the "best in class" companies tracked by the American Society for Training and Development. 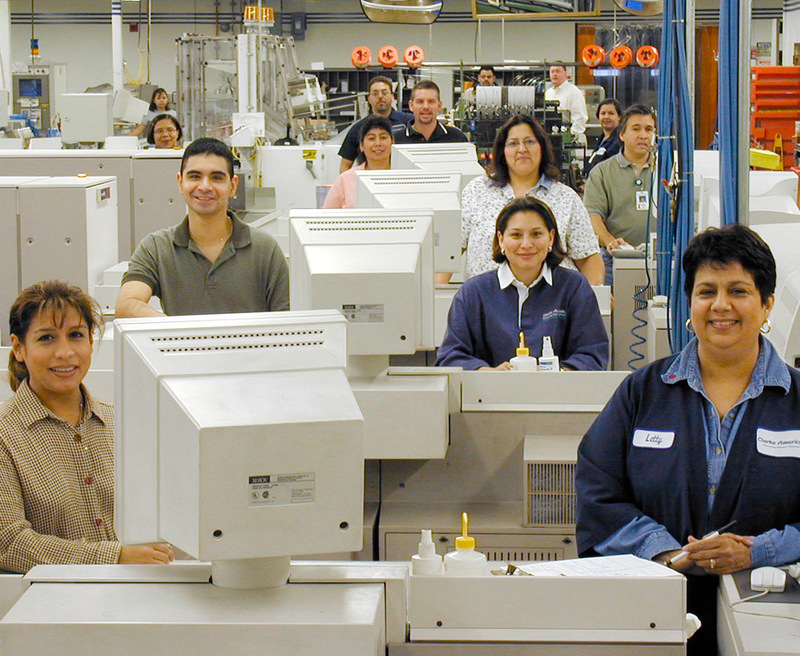 In the early 1990s, when an excess manufacturing capacity in check-printing triggered aggressive price competition, Clarke American elected to distinguish itself through service. Company leaders made an all-out commitment to ramp up the firm's "First in Service®" (FIS) approach to business excellence. Comprehensive in scope, systematic in execution, the FIS approach defines how Clarke American conducts business and how all company associates are expected to act to fulfill the company's commitment to superior service and quality performance. FIS is the foundation and driving force behind the company's continuous improvement initiatives. It aligns Clarke American's goals and actions with the goals of its partners and the customers of these financial institutions. The company uses this single-minded organizational focus to accomplish strategic goals and objectives. The company's Key Leadership Team (KLT)-consisting of top executives, general managers of business divisions, and vice presidents of processes-establishes, communicates, and deploys values, direction, and performance expectations. Leadership responsibilities go beyond task performance. KLT members are expected to be role models who demonstrate commitment and passion for performance excellence. Each year, associates evaluate the competencies of executives and general managers in 10 important leadership areas. Senior leaders also keep a scorecard to track their progress in implementing company strategies and in demonstrating key behaviors, a tool adopted from a previous Baldrige Award winner. Goals, plans, processes, measures, and other vital elements of performance improvement are clearly documented and accessible to all. However, the company also places a premium on two-way, face-to-face communication. For example, KLT members and other senior local management lead monthly FIS meetings in their respective division or process. These two-to-three-hour meetings are held at all Clarke American facilities, and all associates are expected to attend. Agenda items include competitive updates, reviews of company goals and direction, key-project progress reports, associate and team recognition, and question and answer periods. Strategic and annual planning are tightly integrated through the company's Goal Deployment Process. Ambitious long-term (three to five years) business goals help to guide the development of short-term (one to three years) objectives and the selection of priority projects necessary to accomplish them. This dual planning approach benefits from detailed analyses of information. Inputs include periodic studies of the industry, market and competitor analyses, benchmarking results, voice of the customer data, the annual associate opinion survey, partner and supplier scorecards, an independent study of customer satisfaction, and assessments of business performance and core competencies. The Goal Deployment Process has two main objectives: to identify "change the business" objectives and ensure alignment of the entire company. Long-term "change the business" objectives aim for breakthrough business and performance improvements on the order of 20 percent or better. To ensure alignment, measures are used to gauge progress toward these goals and are tracked in the company's balanced scorecard. Annual "run the business" objectives also are generated. These improvements in daily operations are deemed necessary to satisfy evolving customer requirements and to reach the company's "change the business" goals. A set of key performance indicators is developed to monitor efforts to accomplish short-term operational objectives. Goals are distilled into concrete targets for every process and at every level of the company. Progress reviews also are held at every level. Clarke American believes that empowered and accomplishment-oriented associates are its greatest competitive advantage, and it fully recognizes the correlation between high employee satisfaction and superior performance. From orientation and onward, associates are steeped in the company's culture and values: customer first, integrity and mutual respect, knowledge sharing, measurement, quality workplace, recognition, responsiveness, and teamwork. And, they are schooled regularly in the application of standardized quality tools, performance measurement, use of new technology, team disciplines, and specialized skills. In 2000, associates averaged 76 hours of training, more than the "best in class" companies tracked by the American Society for Training and Development. Work teams and improvement teams carry out efforts to attain operational improvements spelled out in "run the business" goals. Cross-functional project teams attend to "change the business" initiatives. Sharing of knowledge across teams, a company value, is facilitated through systematic approaches to communication and a highly competitive team excellence award process. Actions, Results-program. In 2001, more than 20,000 process improvement ideas saved the company an estimated $10 million. Since the program started in 1995, implementation rates for S.T.A.R. ideas have increased from below 20 percent to 70 percent in 2001. At the same time, financial rewards flowed back to associates, who averaged nearly $5,000 in bonus and profit-sharing payouts. Since 1995, Clarke American has invested substantially in new technology, using it to improve performance and to deepen relationships with partners through its offerings of customer management solutions. For example, with a major information technology supplier, the company developed digital printing capability that enables it to provide faster and more customized products and services to financial institutions and their customers. New technology has led to major reductions in cycle time, errors, nearly complete elimination of hazardous materials, less waste, and dramatically improved quality. Clarke American, its partners, and its associates are reaping the benefits of these and other improvements. Since 1997, company-conducted telephone surveys of partner organizations consistently show a 96 percent satisfaction rate. Partner loyalty ratings have increased from 41 percent in first quarter 2000 to 54 percent in third quarter 2001. In independent surveys, commissioned by the company every 18 months, Clarke American's customer-satisfaction scores for all three partner segments are trending upward and top those of its major competitors. Among Clarke American associates, overall satisfaction has improved from 72 percent in 1996 to 84 percent in 2000, when survey participation reached 96 percent, comparable to the world-class benchmark. Rising associate satisfaction correlates with the 84 percent increase in revenue earned per associate since 1995. Annual growth in company revenues has increased from a rate of 4.2 percent in 1996 to 16 percent in 2000, compared to the industry's average annual growth rate of less than one percent over the five-year period.